On Sunday, Nov. 6, in Redwood Valley, one of two small Mendocino County towns where the Russian River's headwaters spill from the southern Mendocino Range mountains, cars overflowed the parking lot at the local grange and lined rural East Side Road in both directions. Several hundred people had gathered to listen to activists report back from Standing Rock where they had stood in solidarity with Native American tribes known as Water Protectors who oppose the Dakota Access Pipeline. "It was the greatest honor of my life," Rodriguez says. "It was an incredible blessing. The entire experience was a spiritual awakening." Opposition to the Dakota Access Pipeline has galvanized support from all over the world. Constructed mainly by Fortune 500 company Energy Transfer Partners, the pipeline originates in the Bakken oil patch and traverses North Dakota, South Dakota and Iowa, and ends in Illinois, linking to transmission routes to the East Coast and Gulf Coast. For several months, indigenous people, environmentalists and Great Plains residents have protested the project because it threatens water quality and myriad sacred sites of the Standing Rock Sioux. It will also contribute to the global climate crisis. The movement against the pipeline has touched deep into the heart of indigenous communities in Northern California. Hundreds of people from the North Bay and North Coast, indigenous and non-indigenous alike, made the trek to the area of wind-swept prairie where the Cannonball and Missouri rivers meet. 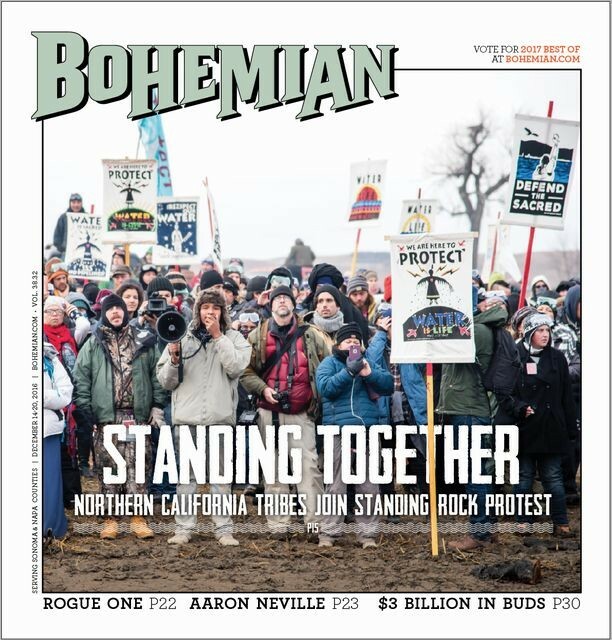 On Dec. 4, the Standing Rock resistance achieved a major breakthrough when the Army Corps of Engineers denied Energy Transfer Partners' request for an easement to build the pipeline beneath the Missouri River, requiring a full environmental impact statement before that part of the project can proceed. Local support has manifested through fundraisers, rallies and ceremonies. Earlier this month, more than 500 people marched through downtown Santa Rosa to the beat of traditional drums. More than 600 people attended a November fundraiser in Sebastopol, with hundreds also turning out for events in Mendocino, Lake and Humboldt counties. Windsor resident and substance-abuse counselor with Sonoma County Indian Health Adam Villagomez, who is Dakota Sioux and Chippewa, has been at the forefront of Sonoma County's support efforts for Standing Rock. He traveled with his wife and three sons there in the week preceding Indigenous People's Day, otherwise known as Columbus Day. Villagomez says that Standing Rock is only the leading edge of a much larger spiritual and political phenomenon that involves recognition of indigenous sovereignty, water protection and climate-change activism. "Standing Rock is a spark that ignited fires in many people, which are going to grow and spread as people continue to bring the same spirit home to their communities," he says. The protests at Standing Rock first started making headlines in August. Much of the attention focused on the police's brutal treatment of protesters. With North Dakota's Morton County Sheriff's Department in the lead, police used high-powered water hoses, dogs, rubber bullets, sonic weapons, pepper spray and tear gas against the Water Protectors, who resisted efforts to move them out. The level of force and the militarized appearance of the police captured national headlines partly because they were out of proportion to the physical threat posed by the activists. Brandy Toelupe, a lawyer for the National Lawyers Guild, helped file a lawsuit against the sheriff and other police agencies for using excessive force. "From the beginning, governments have used their latest technologies to take land and resources from native nations and oppress indigenous peoples," she says. The Morton County Sheriff's Department's "actions make it clear that nothing has changed." In late November, a demonstration outside of the Oceti Sakowin camp called attention to a police barricade that prevented emergency services vehicles and other traffic from accessing the Standing Rock Sioux Reservation's northern access route since late-October. A line of riot police responded by firing concussion grenades and rubber bullets, and drenched hundreds of people with high-powered water hoses amid freezing temperatures. I stood on or near the Blackwater Bridge on Highway 180—the center of the action—for several hours that night. People wielded plywood and galvanized aluminum roofing shields to protect themselves and their comrades from the rubber bullets. Many sang their culture's traditional songs as expressions of prayer-filled defiance. The pungent smell of tear gas periodically filled the air, mixing with the more persistent smell of vomit produced by the tear gas. Sometimes, the police directed the rubber bullets at people's faces and chests. Cars transporting volunteer medics periodically parted the sea of people on the bridge. By night's end, the police had wounded more than 150 unarmed individuals. Yet people kept streaming to the frontline of the action. The chaotic scene lasted for more than six hours. A 21-year-old woman whose arm was nearly torn off by an explosive grenade is still undergoing multiple surgeries as of this writing, and faces permanent disability. Another protester was shot in the eye, leading to possible blindness. Among those on the frontline that night was Loren Lincoln, a Wailaki from the Round Valley Indian Tribes in northeastern Mendocino County, California's largest reservation. He first traveled to Standing Rock immediately after private security guards in Energy Transfer Partners' employ set dogs on protesters, severely wounding several. "Fortunately, the bullets whizzed past me out here," he says. "I was one of the lucky ones."